What Type of Look Do You Want For Your Log Home? When it comes to the aesthetics and build quality of a log home, there is a history behind the craftsmanship that is still used to this day. Many of the historic wood homes in the United States come from Scandinavian construction that was brought to the Americas in the early 17th century. 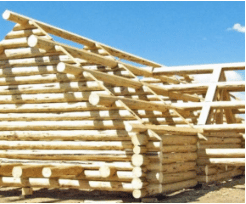 The original method of using full round logs with an axe and a draw knife is the type of construction that has been passed down over the years, and it is the root of how Frontier Log Homes still builds to this day. Since the 1920s, milled and manufactured logs have become popular. It can often be difficult to understand the difference in quality between both styles. By looking at the shape, you can see a lot about the construction and the quality of the build—specifically the difference between a D-log and a full round. One of the differences in the methods of crafting this type of home is the signature shape of the wood. Alternatively, D-shaped logs are milled, stacked, then erected to complete the structure. An easy way to see the difference between a round and a D-log is to imagine cutting it open to look at the rings inside. A round log will show you every ring in its entirety. If you were to look at the rings on a D-log, you would see some of the rings are cut off, because the interior side of the piece of wood has been trimmed flat. The log has a distinct uppercase “D” shape, hence its name. With a D-log, larger timbers are sent through a mill, removing the bark and some of the trunk’s width, reducing all of the timbers down to a uniform size and shape. A full round log is a sign of a hand-hewn and hand-built home. When it comes to a more natural and historical look, this is the way to go. A craftsman peels the bark off of each individual timber with a draw knife, allowing the natural shape to remain intact. It creates that signature look of a chink-style cabin that has been built in the United States for over 400 years. With full round logs, the build is completed one at a time, and it will be unique to your personal style and needs. If this is the style that you are looking for, call one of the experts at 970-289-9765.